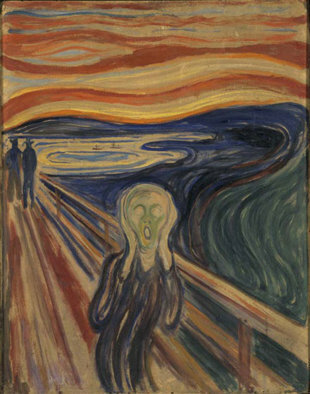 Most of us know The Scream as a painting of excruciating desolation. You have to be a learned art connoisseur to appreciate the artistic quality of this painting. My grandmother, Farida, who suffered transplantation during WWI, would probably not have included it when she packed up the few things to put in her knapsack. Norway, the artist’s home, has an extensive social welfare system. Norway has a lot of money acquired from their extraction of petroleum in the North Sea. They keep their money for their citizens and don’t dribble it away on wars and foreign aid to countries that hate them. A compulsory National Pension plan provides citizens with benefits such as universal child support, one-year paid maternity leave, and pensions for old age, disability and rehabilitation. Norway's extensive attention to the medical and financial needs of its people translates into a long average lifespan. Seems like a happy place to me. I haven’t thought about Jell-O in decades. I was never a big fan of Jell-O (the dessert) and aspics (the savory version of gelatins). It would take a lot of money to get me to willingly make an aspic. Last week, I was browsing the baking aisle in the supermarket and discovered a shelf full of puddings and gelatins. The cursing angel of good, said to me “Why the f**k are you so against Jell-O?” To my surprise, the sugar-free version of Jell-O has O calories. What? I took a box home. It was so good, I ate the entire portion while it was still only half jelled. Mmmmm...Jello. Truly one of life's underrated pleasures, unless the fact that it's primary ingredient is boiled down hooves bothers you. I can usually manage to overlook it. My grandmother used to hold a neighbor boy who had memorized the entire Bible up to us as an example of brilliance. The fact that he didn't go to "regular" school and had never mastered toilet training didn't sway her opinion one bit. Wonder if Mensa would accept him. Carlarey just reminded me about the horses' hooves part. For 0 calories, I can deal. Mensa would love that Bible spouting boy. You make pizza? she asked, astounded. Sounds crazy but I think it works.